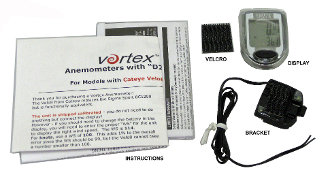 The Display kit is a slightly modified Cateye Velo8 bicycle speedometer (please note!). We remove the reed switch end, strip the wires, calibrate it to produce the correct wind speed (WS of 114), and put super HD velcro on the back so it can be mounted anywhere. Note: only for use with Inspeed Classic or Version II REED SWITCH anemometers (not Hall or optical).